All of you know of my addiction to all things Isa Chandra and PPK. Well, last night as the temperatures decreased at alarming rates we found ourselves wanting to have something tasty but still healthy and warming. That’s when Isa Chandra just somehow seemed to know what I was looking for and virtually sent it to me (without even knowing herself). 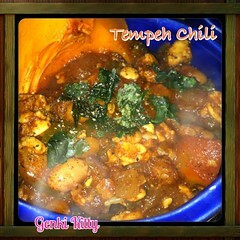 The recipe came in the form of Tempeh Chili Con Frijoles. Hello anything that has tempeh and chili in the same title really does catch my eye. With our last visit to Trader Joe’s I stocked up on Tempeh (since it can be 3x the price in health food stores) and boy am I thankful. Putting the recipe together did take some reading. Um, did I mention my brain goes to mush and I lose all ability to do anything in the cold temps? I managed though and I put it together in about ½ the time that the recipe stated – cold and hungry I turned that cooker up to high and went all out on it. Working man and I loved it so much we made sure we put two servings away in the fridge for lunch just in case we came back for more. It’s definitely got the chili flavor that pops in my mouth and leaves a tiny bit of a burning sensation but unlike the burn with jalapeños (which I’m sure would go great in this too). Then you are left with the meaty pinto beans and tempeh to fully tidy over the hunger side of your body. Total nirvana for a vegan that is living in the cold – yum! Q: What’s your favorite Winter Recipe? Unauthorized usage or duplication of this material without expressed and written permission from Genki Kitty is strictly prohibited. Short text excerpts and links may be used, provided that full and clear credit is given to Genki Kitty with appropriate and specific direction to the original content. Use of photos or recipes are not permitted.